How’s your Friday going this week? 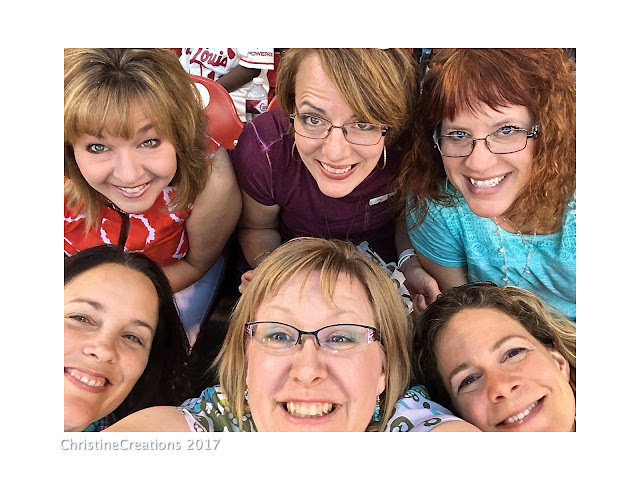 As some of you probably saw via Marcy’s instragram or facebook page, The Bloom Brigade (minus 1 - our sweet down-under girl Kathy), gathered last weekend in St. Louis for a Bloomie Blow Out! It was a trip all for fun and relationship. After 9 years of working with or for Marcy, I finally got to meet her in person and hug her sweet little self. 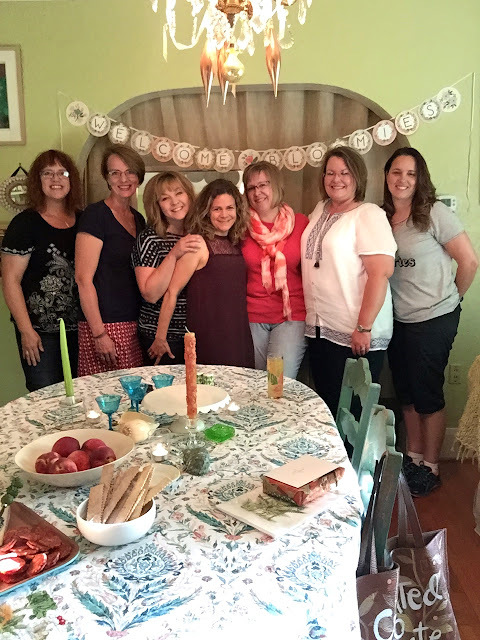 She is as charming, bubbly, warm, creative and vibrant as you have imagined and we had a fantastic girl weekend bonding and seeing the sights of St. Louis. So much joy rolled into a few short days. This week it’s been back home to try and gather myself back to work and family. I’ve had a whirlwind month with family visiting, lots of milestone family events, a busy ministry role and a trip thrown in. I could use a little down time! 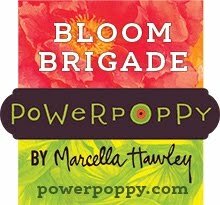 I spent a few hours colouring up this brand new digi image from the Instant Garden at Power Poppy called Luminous Bouquet. It’s a stunning image filled to the brim with Japanese Peony, Hydrangea, Clematis, and Oxalis. I chose to go with the no-line version of the image, because now Marcy gives us options! A cool palette of colours pulls it all together. In the background I used a stencil and some embosssing paste to bring texture and after it was dry I sponged in more of that amethyst colour to to take on those purple tones. A windowed design in layers, a bit of piercing, delicate rhinestones and some baker’s twine finish it off. The sentiment is from another of our polymer sets, So Grateful, and I curved it a bit to match the curve of the oval window. Here are the Copics I used and there are a lot of them. You can see in the colouring how I try to pull in the colours to make a multi-flower design cohesive, so there is purple in the shading of the pink peony, green in the blue hydrangeas, pink in the purple centers of the clematis, purple in the oxalis...just these little details tie the over all colouring together. I’ll leave you with a couple of my favourite pictures from the Bloomie weekend....you could not find a group of lovelier, warm, fun, supportive and creative women around! Blessed to know each of them, and maybe next time we can have our Kathy join us from down-under too! At the St. Louis Cardinals MLB game! Marcy’s girls made us the Welcome Bloomies sign :) Her beloved Doug and her kids are awesome, what a treat to meet them all and see the love they have for each other! Of course we had to have some flower time, after all we are the Bloomies! 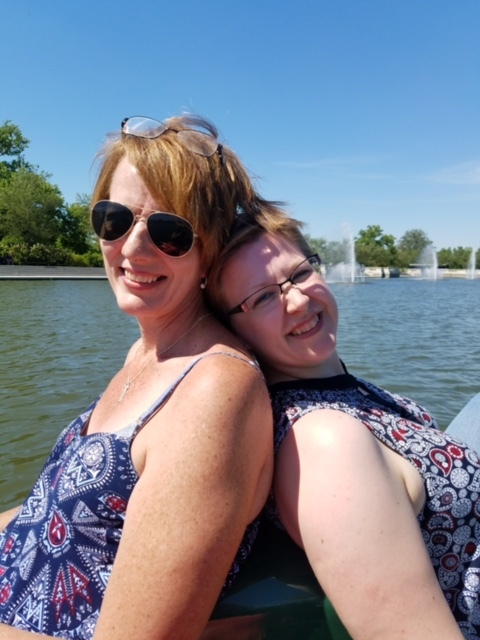 Lots of sun and wamth paddleboating at Forest Park, I was leaning on Cindy for support for the paddling! 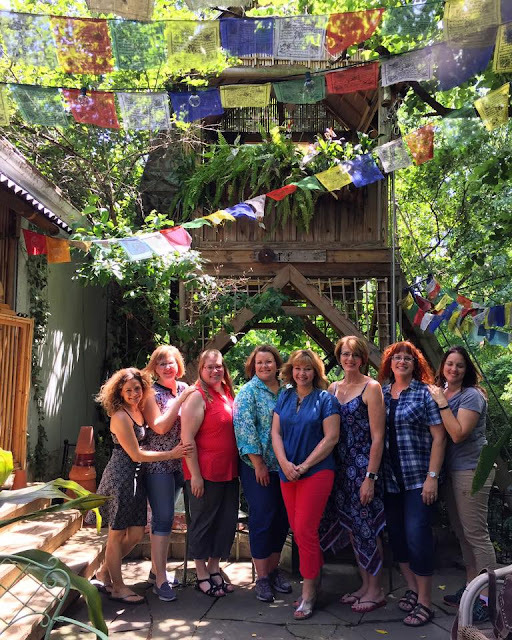 Meeting Mary Engelbreit at her studio. That was an awesome experience! Thanks for sharing a bit of it with me. 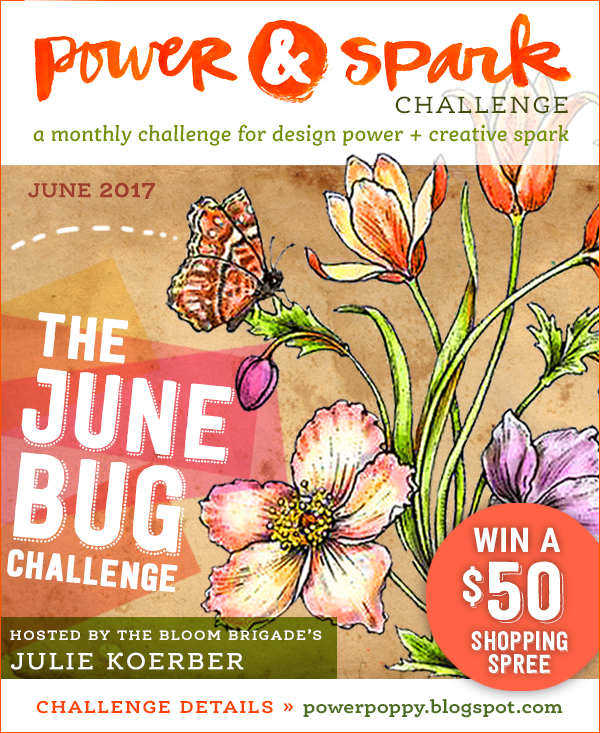 I’ll leave you with a little reminder about our Power & Spark Challenge for the month of June....it’s called the June Bug Challenge and all you need is to include a little bug on your creation somewhere. 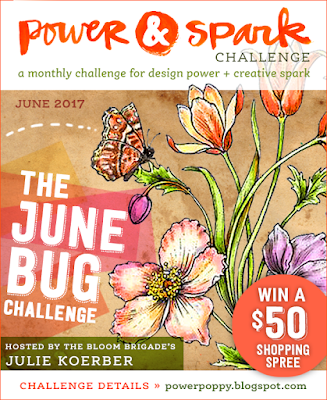 Enter in the challenge and you could win a $50 Shopping Spree at Power Poppy! Wow I love this, your coloring and background are perfect!! Beautiful colors and coloring and texture! Your card is an ethereal wonder! I soooo loved the pictures of all you Bloomies, Christine! Looks like such a great time and you all look so happy! 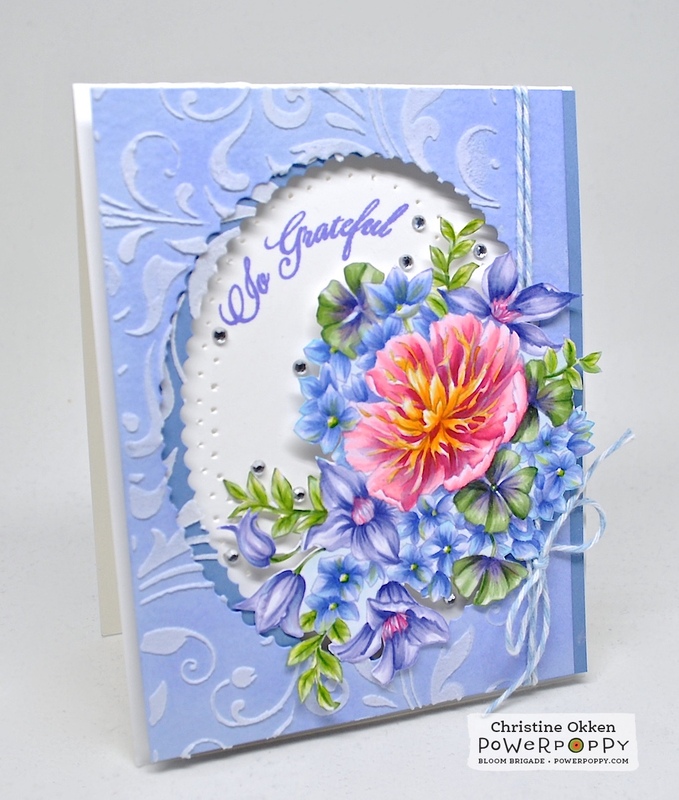 Wow stunning card the colours are wonderous and the added depth with the embossing paste, brilliant. Oh wow you were only about 30 minute drive from me, looks like you all had a great time together, how fun!! Your flowers are just amazing, beautiful coloring!! It looks like you had such a wonderful time! This card is absolutely beautiful! Your coloring is breathtaking!